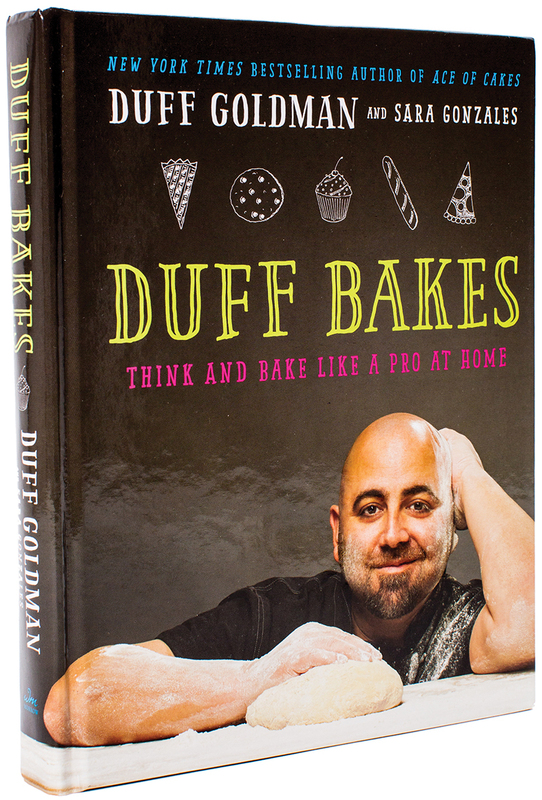 Duff Goldman writes a bang-up baking book. Long before he became famous for his sculptural specialties on the Food Network’s Ace of Cakes, Duff Goldman made muffins and baked biscuits at Cindy Wolf’s Savannah in Fells Point. And though the celebrity chef had only fast-food experience at the time, he credits Wolf—now one-half of Foreman Wolf—as the person who helped him break into baking. “I didn’t even know what a pastry chef was,” Goldman says. “Thanks to Cindy, I started to understand baking fundamentals.” Clearly, Goldman was a star student. These days, he runs a bicoastal bakery business in Baltimore and Los Angeles and has appeared on the Food Network’s Duff Till Dawn. In addition to designing the cake for Jennifer Aniston and Justin Theroux’s wedding, his latest project is Duff Bakes: Think and Bake Like a Pro at Home. Recently, we caught up with Goldman to talk about the art of baking—and graffiti. Most cookbooks have big, beautiful pictures that intimidate and scare people. But you don’t have to be so serious when you bake. The book is full of science and technique fundamentals, but it’s also very funny. I really want people to read this book. I wanted to write it in a way that it wouldn’t be over anyone’s head. Baking is viewed as this mysterious alchemy that only the fortunate few can do, but that’s not true. What appeals to you about baking? I’m obviously artistic and think mathematically, too. I minored in philosophy [at the University of Maryland, Baltimore County] and am very introspective. I enjoy the thought process that goes into baking and all the things that you have to consider like temperature, altitude, the brand of the oven . . .
What’s your advice to someone who wants to go pro? Anyone who wants to be a chef should work at McDonald’s. It teaches you consistency. Every burger has to be exactly the same every time. I was a graffiti artist at 13. I was breaking into train yards, spray-painting in subway tunnels, and climbing buildings to get that one spot that people would see from the street. Because I conquered a lot of fear when I was so young, that fearlessness stuck with me. When I was first put on camera for the Food Network, I wasn’t afraid to look stupid. You dedicated your book to chef Cindy Wolf. Why? She changed my life. If I hadn’t met her, who knows where I’d be right now? Cindy is 100 percent directly responsible for my success, though I don’t think she’d want me in her kitchen now. Preheat the oven to 375˚F and grease a 9x13-inch baking dish or cake pan, or a 12-cup muffin tin.